Are you receiving the internet speed you expect from your service provider? There are quite a few factors that go into the actual speeds you experience, from the capabilities of your hardware, to the quality and consistency of your ISP’s service and network connection. Running a speed test is a great way to check your connection to ensure you’re getting what you paid for. In this review we will take a look at the Cox speed test tool. Is it a reliable option for you? The main criteria we use for evaluating internet speed test tools is the provider’s ability to accurately and consistently measure download and upload speeds, as well as ping or latency. To analyze these factors, we run five speed tests, recording the results in the table below. In order to create a repeatable testing scenario, we disable all programs except the Google Chrome web browser, which we configure with no active plugins. In addition, while we run these tests in one location, we use multiple devices to ensure that our hardware isn’t causing any irregularities. 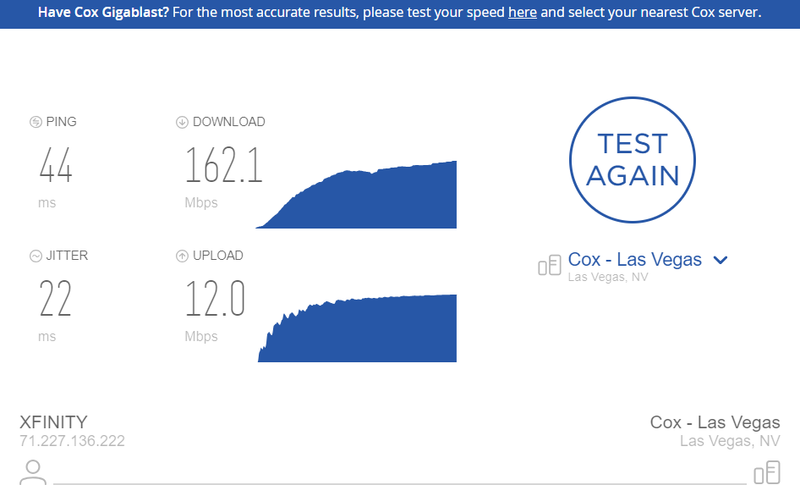 We ran Cox’s speed test using a connection that delivers download speed of up to 250 Mbps. 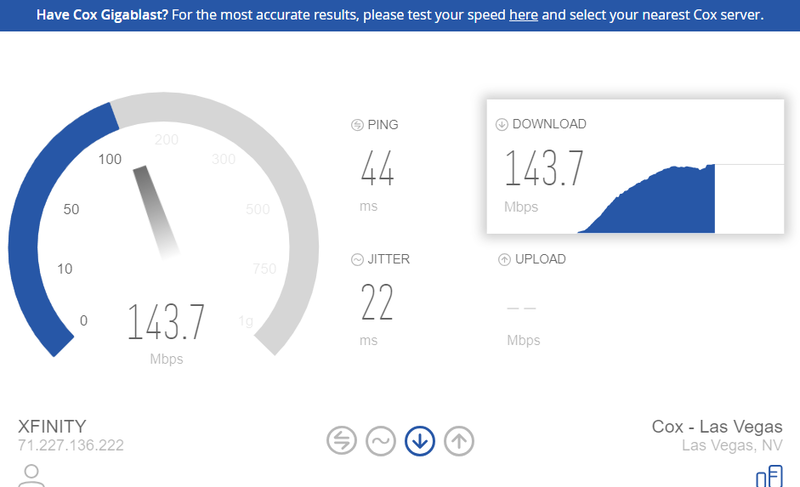 While the resulting speeds from the Cox speed test were within our expectations for this connection, we should note that the download speeds recorded by Cox were about 50 Mbps lower than results we received on the same connection using other providers’ tests. There’s a lot to like about the Cox internet speed test, starting with the clean presentation. The website is secure and optimized for mobile use, and the page layout is quite user-friendly. There aren’t any ads littering the page, and the graphics are pleasant without being overbearing. There’s also a good deal of information on-screen, including IP address, internet provider data, and more. After you complete your speed test, Cox provides a wide range of options for improving your internet speeds. They provide step-by-step instructions for how to reboot your equipment, properly connect your cables, restart and/or disconnect your WiFi and VPN, update your software, and check your equipment’s capabilities. Overall, the Cox speed test’s smooth, no-frills presentation works well, with minimal confusion. There are also some aspects where the Cox cable internet speed test falls flat, especially when it comes to their limited number of bandwidth test locations. We ran our series of five tests in Seattle, Washington, but because Cox has so few test locations, the closest servers we were able to connect to were located in either Las Vegas or southern California, over 1,000 miles from our location. Because of this, there’s some question as to the accuracy of the results we received. The other negative aspect is a much smaller issue, which is the fact that the speed test doesn’t store your results. Even for Cox customers, while you can check the speed test results against your internet plan to ensure you’re getting what you paid for, there’s no history feature for the test results. At the end of the day, how much value you get from the Cox speed test probably boils down to how close you’re located to one of their few testing locations. It’s important for any speed test to provide plenty of bandwidth test locations, and this is the one area where Cox really stumbles. Other than that, we think the Cox internet speed test is quite strong. The presentation is attractive, and the user interface is about as easy to use as they come. The lack of unnecessary advertising is another big plus, and we appreciate the way they present so many tips for improving your speeds ― especially since they provide several ideas that don’t simply involve ponying up more cash to upgrade your service. With the addition of a few more testing locations, the Cox speed test could be one of the best in the industry. As is, it’s still a solid option that records accurate and reliable data more often than not.